← Inolivia | Easter 2018 | Stay tuned! Test: Greek vs American Breakfast – which is better? These days we are all much more health conscious, so probably the quintessentially all-American staples of waffles, bacon, hash browns, fries and eggs done one of a dozen ways, is now something of a guilty pleasure. 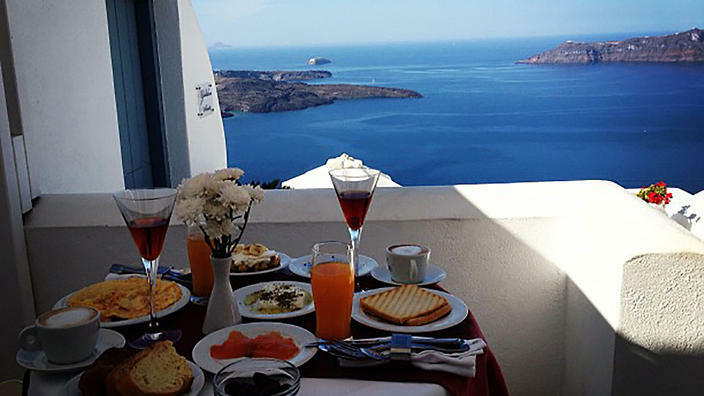 In Greece, depending on the region, the traditional breakfast still conforms to the healthy Mediterranean diet. Olives and olive oil have their role, as do fresh tomatoes and traditional cheeses and yoghurts. Some regions also have traditional soups for breakfast. And, like its American version, the Greek breakfast often incudes eggs. Greeks also love fresh bread and in all its main towns and cities, people still purchase fresh bagel-like koulouri from street sellers. On the sweet side, Greeks will often have local honey or tahini plus fruit. For those on the go there is also Greece’s vast array of pies filled with cheese, spinach and so on. Added to all of the above, of course, is the ubiquitous Greek coffee, a treat which is said to carry its own health benefits. While what is on offer in hotels across the mainland and Greek islands is perhaps not what many Greeks eat every morning, it still reflects the cuisine’s Mediterranean roots. And while frozen yoghurt and honey might be something of a tourist attraction, it still sounds more healthy than waffles with syrup. At the end of the day, it all comes down to choice — so, which do you prefer? This entry was posted in Banavas Estate, Health-Nutrition, Inolivia - Rich & Pure Flavors and tagged greek breakfast, health, healthy, olives. Bookmark the permalink.